Ashok Goel is a Professor of Computer Science in the School of Interactive Computing at Georgia Institute of Technology in Atlanta, USA. He obtained his Ph.D. from The Ohio State University. At Georgia Tech, he is also the Director of the Ph.D. Program in Human-Centered Computing, a Co-Director of the Center for Biologically Inspired Design, and a Fellow of Brook Byers Institute for Sustainable Systems. 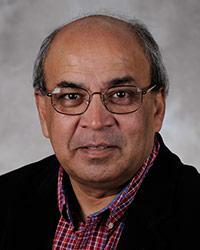 For more than thirty years, Ashok has conducted research into artificial intelligence, cognitive science and human-centered computing, with a focus on computational design, modeling and creativity. His recent work has explored design thinking, analogical thinking and systems thinking in biological inspired design (https://www.youtube.com/watch?v=wiRDQ4hr9i8), and his research is now developing virtual research assistants for modeling biological systems. Ashok teaches a popular course on knowledge-based AI as part of Georgia Tech’s program on Online Masters of Science in Computer Science. He has pioneered the development of virtual teaching assistants, such as Jill Watson, for answering questions in online discussion forums (https://www.youtube.com/watch?v=WbCguICyfTA). Chronicle of Higher Education recently called virtual assistants exemplified by Jill Watson as one of the most transformative educational technologies in the digital era. Ashok is the Editor-in-Chief of AAAI’s AI Magazine.